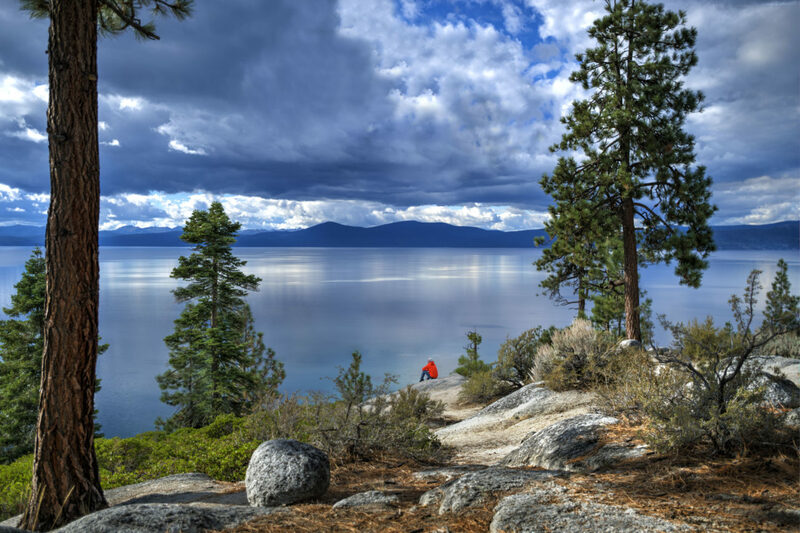 Lake Tahoe is one of the world’s largest lakes and one of the most picturesque places on the planet. 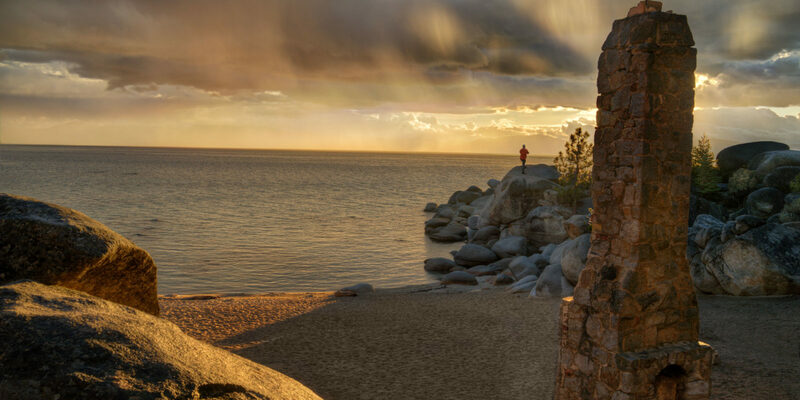 For a unique view that’s off the beaten path — and some breathtaking panoramic pictures — I suggest going on the Chimney Beach hike at Lake Tahoe State Park. 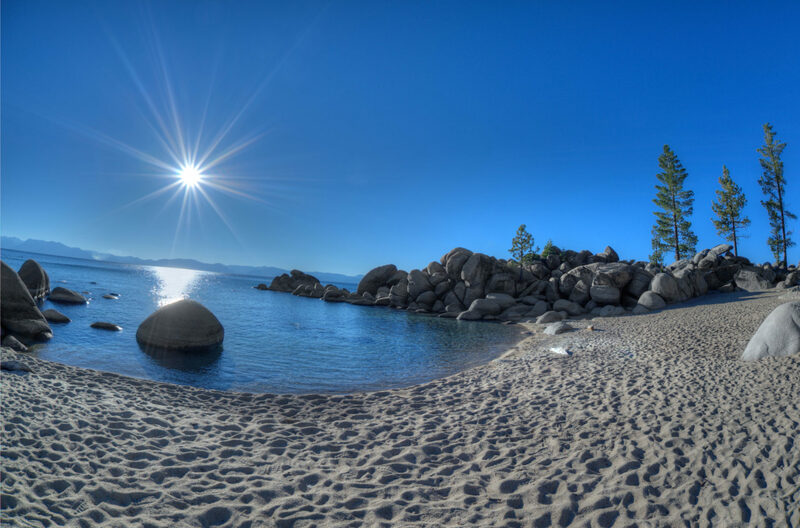 About 25 minutes from the center of town, just off State Route 28 on the Nevada side of Lake Tahoe, you’ll find the entrance to Chimney Beach — along with plenty of parking (and a portable toilet). The trail takes about 30 minutes to hike and consists of a series of switchbacks that lead down to the water. Some stretches of the trail are a little steep, but none of the terrain is impassable by your average hiker. It’s more akin to a walk in the woods, with a few steep areas. Hiking shoes will help, but you can probably make do with sneakers or any closed-toe, rubber-soled shoe. You’re at a higher elevation in Lake Tahoe, so always carry plenty of water. You may also want to bring supplies for a picnic or a sunset cocktail. Bring your camera or make sure there’s plenty room on your phone for photos, because you’ll discover amazing vistas from the moment you round the first switchback. Rocks don’t have the most exciting reputation, but the ones at Chimney Beach are actually something to write home about. They look exactly like the stones used in ornamental landscaping — smooth, rounded and pretty. Except there’s one big difference: the rocks you’ll find on the shore of Chimney Beach are the size of Volkswagens! For the best vantage point and a spectacular sunset spot, hike all the way down to the beach that has the old chimney on it. Climb the pile of giant rocks for an even better view. You can easily spend an entire afternoon exploring the trails that run parallel to the beach and just enjoying this beautiful park.